A lot of the documentation I read about tent caterpillars online says that they’re relatively harmless, which is true when they appear on certain kinds of trees. However, when it comes to fruit trees, tent caterpillars can become a horrible problem. In fact, tent caterpillars nearly killed our plum trees (which are still recovering three years later). The problem is one of tree growth. A lot of trees get a secondary growth of leaves. When the tent caterpillars do their job during the mid-spring to late-spring months, they damage the first growth of leaves. The trees can recover with the secondary growth. However, many fruit trees get just one set of leaves for the entire summer, so when the tent caterpillars damage them, the tree is stripped for the summer and can’t store enough energy for the winter months. Tent caterpillars also tend to strip fruit trees, partly because they’re smaller than some of the other trees that are affected by them. In fact, that’s what happened to our plum trees. The foliage was stripped before we knew what was happening and the trees simply didn’t recover. After viewing other trees the tent caterpillars have attacked, it becomes obvious that they really are just a pest at times. Part of the solution is to inspect the trees carefully during pruning. Unfortunately, even a close inspection won’t reveal all the tent caterpillar clusters and some hatch. During the spring months I take regular tours of the orchard to look for the tent caterpillar nests, especially during the early morning when the night moisture reveals the nests with greater ease. (The inspections are also good exercise and are quite pleasant, so it’s not really work in the traditional sense of the word.) I hand pick the caterpillars and ensure I crush them. Removing them from the trees simply invites them to come back later. 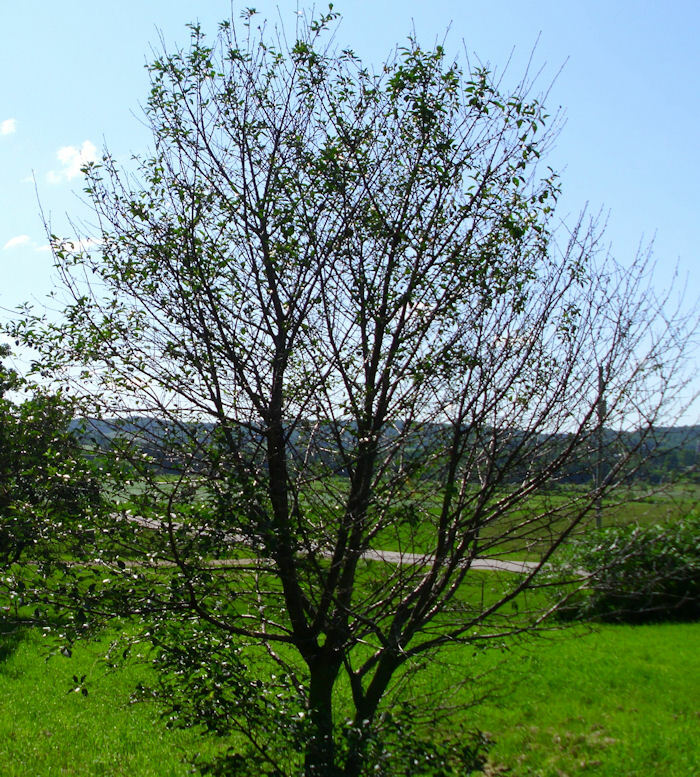 The trees that seem most affected by tent caterpillars are plums and apples. Cherries are also affected, but the tent caterpillars haven’t acquired a taste for the Mesabi cherries for whatever reason (the yellow-bellied sapsuckers tend to avoid them as well). Untouched are the pears, which don’t seem to attract nearly as many pests at other trees on our property do. A proactive approach to dealing with tent caterpillars is essential if you want to maintain tree vitality. Make sure you take that walk each day to mellow out, improve your health, and keep your trees healthy. Let me know your thoughts about tent caterpillars at John@JohnMuellerBooks.com. It doesn’t seem possible that I was complaining about drought last year, but I did (see Unexpected Drought Consequences for details). Our spring has been incredibly wet with rain coming every other day (or, more often, several days in a row). It has been so wet that even trying to cut the grass has been a chore. I finally resorted to using a hand mower and a weed whacker to do the job—the garden tractor was hopeless, it either lost traction and got stuck or the deck would become filled with grass and refuse to do anything more. At least we’re not flooding (yet). Our main concern at the moment is that the garden still isn’t planted. Yes, it has gotten quite late and some items wouldn’t have a chance of producing anything at this point, but many other items will still produce something for us. The problem is trying to till the garden to loosen the soil. The other day I took out my spade to see how things were progressing. The soil in one part of the garden simply stuck together as a mud ball. Digging in another part showed water in the bottom of the hole. Obviously, any attempt to use the tiller will be futile until the garden dries out a little. At least one reader has heard of our predicament (possibly being in the same state himself) and chided me about my comments regarding global warming. I stand by what I have said in the past—global warming is a reality. Global warming doesn’t necessarily mean things will be hot (although, the global average temperature is increasing a small amount each year). What it means is that we’ll see more extremes in weather, such as this year’s really cool and wet spring. As with anything, I try to find the positives. I reported on one of those positives recently, our woods produced a bumper crop of mushrooms. Those mushrooms sell for $25.00 a pound if you can obtain them directly from someone who picks them. Morels are in high demand because they’re delicious. If you pick mushrooms to help augment your income, this is your year. We simply enjoyed them in some wonderful meat dishes, which is a treat considering we usually make do with the canned variety. However, for us the biggest plus is that we’re going to be buried in fruit. The apples, cherries, plums, and pears have all produced bountifully this year. The trees are literally packed with fruit. I imagine that I’ll need to trim some of it off to keep the branches from breaking—an incredibly rare event. It has only happened once before in the 18 years we have lived here. So, for us, this year is the year we pack the larder with good fruit to eat, despite the fact that our garden will produce dismally. Of course, we really do want a garden. At this point, my only option is to go out there and dig it up by hand and then smooth it over with a garden rake. I’ll this task right alongside of mowing the lawn using the weed whacker. We’re talking some heavy duty hours of some incredibly dirty work. Well, someone has to do it. At least I’m getting my exercise, which will help improve my health. So how is your spring going and what do you expect from your garden this summer? Are your fruit trees literally bursting with fruit as mine are? Let me know what is happening with your orchard and garden at John@JohnMuellerBooks.com. In Trimming the Trees (Part 2) I discussed some of the specifics of pruning trees. At this point, my trees are all pruned. However, there is still work to be done. For one thing, this is the time of year when I examine the trees for egg masses of the Eastern Tent Caterpillar. 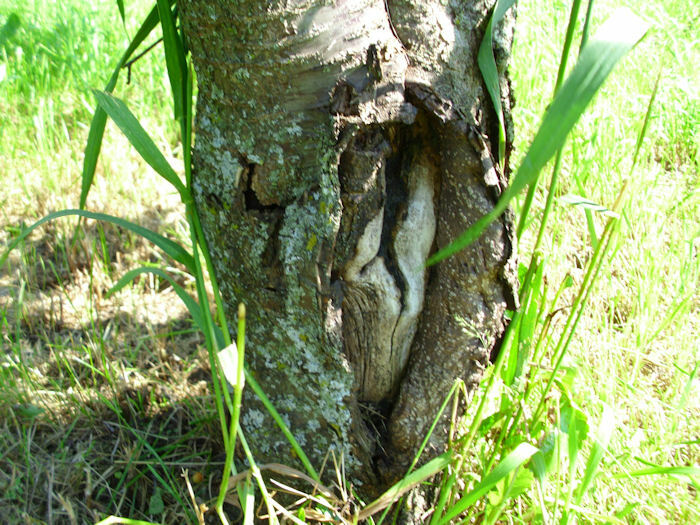 Despite what you may have heard, repeated infestations will definitely kill a fruit tree, especially if the infestation is severe enough. It only makes sense. If you remove all of the leaves from a tree that only gets one set of leaves per season, the tree can’t store energy for the winter months. Our experience has been that they’re a nuisance with apple trees. Yes, the tent caterpillars will cause a problem, but if you get in there and squish all of the caterpillars in the tent (or better yet, get rid of those egg masses in the spring), the apple hardly notices. However, plum trees seem to attract tent caterpillars like magnets. All four of our plum trees were in danger from dying at one point because we simply couldn’t keep the caterpillars under control. We did try a number of sprays—all of which proved ineffective. Spaying the trees with a dormant oil spray in the spring helps only a little. By far the best strategy is to hunt down the egg clusters and destroy them. The secondary strategy is to look for the tents absolutely every day in the spring and summer after the trees have leafed out and destroy them by individually squishing the caterpillars by hand. We actually had two of our plum trees stripped of leaves in a single day by these pests. While we’re looking for tent caterpillar egg clusters, we also look for other problems in the trees, such as disease, insect infestations, and so on. It’s easier to find problems after you’ve pruned the trees and there are fewer branches to check. Taking time now to check the trees will save you a lot of effort later. Of course, now we have a pile of branches to deal with. This year we pruned our pear trees heavily because they’ve become a little overgrown. If pear trees get too overgrown, they’ll tend to prune themselves in heavy winds—usually not in a way you would have chosen. The pile of branches from all of our trees is quite high this year. We’ll put all of these branches through the chipper and then use them for mulch. A lot of people would probably burn the branches up, but using them for mulch does save at least some money. I’ve been trying to figure out the environmental balance in this case. On the one hand, burning the branches would produce a lot of particulate smoke that would pollute the air for at least a while. However, using the chipper also produces pollutants, and some of those pollutants are harsher on the environment than the smoke from burning would cause. If we had burned the branches, I would have placed the pile in the middle of the garden. That way we could have plowed the ashes into the ground where they would have provided fertilizer on top of the winter rye you can see growing in the background of the picture. So, either way, the branches wouldn’t have gone to waste. However, we really need the mulch more than the ashes, so we’re creating the mulch. Our orchard is ready for spring at this point. Let me know about your tree pruning and bug eradication experiences at John@JohnMuellerBooks.com. I’m starting to get down to the last few trees in the orchard (and I may not be able to get them because the sap is starting to run). When the pruning is light, I can get through all 33 of my trees in a couple of days—assuming I can work all day at it and the weather isn’t too cold (or hot). This year it’s taking a bit longer because I’ve had a number of personal issues that have kept me from working full days outside. Even so, I normally don’t get the trees finished until the end of March or beginning of April, so I’m getting done early this year. As mentioned in Trimming the Trees (Part 1), when to prune is a matter of much debate. Some people prune their trees in the fall, some in mid-winter, and some a bit earlier in the spring than I do. Part of pruning your trees is knowing how to prune that particular tree. For example, I visualize an umbrella shape when trimming apples. In fact, a lot of home growers use this particular shape. An umbrella shape is quite strong and tends to ensure a good harvest. In addition, the umbrella shape is easier to pick. Commercial orchards use a variety of other shapes, some of which work best when the pickers are working from the back of flatbed trucks. Some people tie down water sprouts to obtain the umbrella shape, which tends to stress the tree. I prefer to look for branches that are already heading in the right direction and trim off everything else. Water sprouts are branches that grow straight up from joints in the tree. You need to trim these off as they’ll never produce any fruit. Our pears and cherries are dwarf trees with a strong central leader. When pruning these trees, I visualize a flame shape. The tree should be topped to keep it from growing too high. Yes, you’ll get fruit all the way up, but the problem is figuring out a way to pick it without damaging the tree. Keeping the tree down to between 14 feet and 16 feet high ensures that you can reach all of the fruit in fall. Water sprouts aren’t a problem with the central leader trimming technique. What you want to do is ensure that none of the branches are crossing and that the limbs aren’t overextended. Cherry trees require a significantly lighter hand than pears do. In fact, pear trees are quite forgiving when you over-prune them. Cherry trees are also stronger than pear trees. If you don’t trim your pear trees heavily enough, the limbs have a habit of breaking off at the crotch, especially in high winds. Plum trees are just plain messy looking. I don’t think I’ve ever seen one that I would consider a beautifully shaped tree (at least, not one that produces fruit). Plum trees are normally trimmed using the open center approach. This technique relies on three or four branches attached to a main trunk. You don’t trim the tree heavily. In fact, unless there is some sort of problem with crossing branches or water sprouts, you don’t trim at all. Of all the trees, prunes are the least forgiving when it comes to over-pruning. They grow slowly, so taking off too much this year means paying for several years. Two of my prunes actually look more like a bushes than trees and I trim them quite carefully to keep them that way. Some trees produce well every other year. My apples are this way. They’ll produce quite heavily one year and then take a vacation the next. With this in mind, I establish a pattern of trimming heavier on off years and lighter on production years. This way, I maximize the amount of fruit I get from the tree and still maintain it properly. I haven’t personally tried my hand at growing anything more than apples, pears, plums, and cherries. However, the basic techniques I use likely apply to most fruit tree types. My next project is to try my hand at growing some nut trees. Hickory nuts and butternuts grow well in this area, so I’ll try them first. Unfortunately, we can’t grow English walnuts or you can be sure I’d be planting them. We can grow black walnuts, which work well in baked goods. The only technique I haven’t tried so far is the trellis technique of pruning for fruit trees. I’d love to hear from anyone who has tried it at John@JohnMuellerBooks.com. In my last post (for now) on this topic, I plan to discuss some of the things you should look at on the tree while pruning. There are many different theories about trimming fruit trees. Talk to five orchards and you’ll likely hear five completely different tales of the precise technique that someone should use for trimming fruit trees. My own personal theory is to trim the trees later in the winter or early spring, before the sap begins to run, but after the majority of the hard winter weather is gone. The idea is to have fresh cuts to encourage growth, but also to let the cuts heal before the sap runs so that the tree won’t “bleed” from the trimming. Other people trim in the fall or at other times during the fall to winter season. 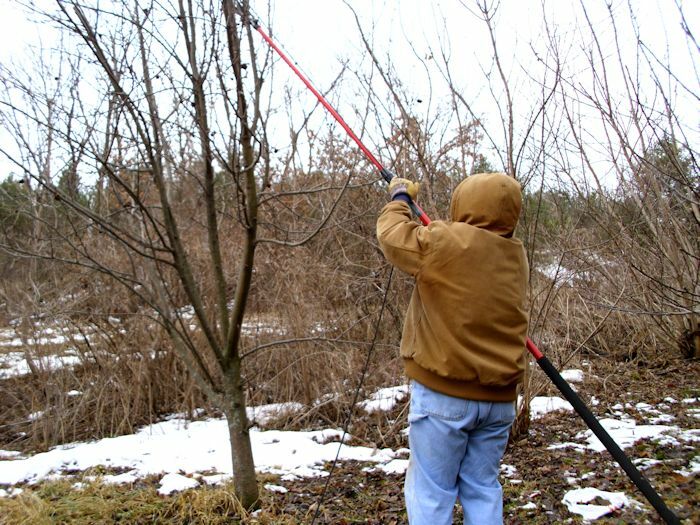 One thing you never want to do is to trim your fruit trees after the sap begins to run because the tree will lose too many nutrients that way. Rebecca prefers a ratcheted hand pruner. It helps amplify her hand strength so that trimming the tree isn’t quite so hard. 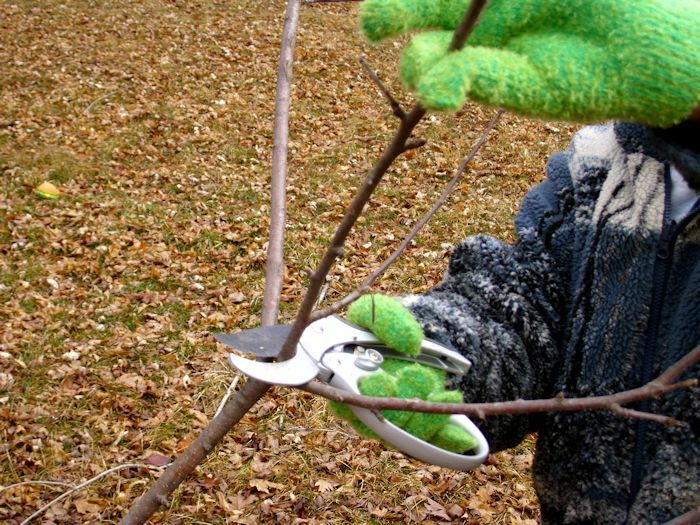 In addition, you can generally prune larger branches using a ratcheted pruner than you can other hand pruner types. There are many different types of trimmers and you should choose the type that works best for you. I generally use an anvil-style hand pruner. It requires significantly greater hand strength to use, but in exchange, I get cleaner cuts, I can trim the tree faster, and the pruner itself wears longer. I strongly recommend against using bypass hand pruners on trees because the blades tend to bend and not produce a clean cut. A bypass pruner works much like a scissor and the tree branch can become wedged between the two blades. In addition to hand pruners, your tree trimming kit should include a lopper, which is used to cut thicker branches. I highly recommend a long handled geared lopper because it will last longer, produce smoother cuts, and require less muscle to use. A good lopper will enable you to cut branches up to 2-1/2 inches in diameter in most cases. The idea is to use the lopper whenever possible because it produces a smooth cut that won’t bleed as much. At some point, you’ll encounter branches that you can’t cut using a pruner or a lopper. In this case, you must resort to using a pruning saw. As with pruners and loppers, pruning saws come in all sorts of shapes and sizes. When working with fruit trees, you want to get a curved razor tooth saw so that the cuts are as smooth as possible and you have the fullest possible range of motion. Remember that when you cut with a saw, you start by making a counter cut on the opposite side of your final cut. Then you make the final cut. 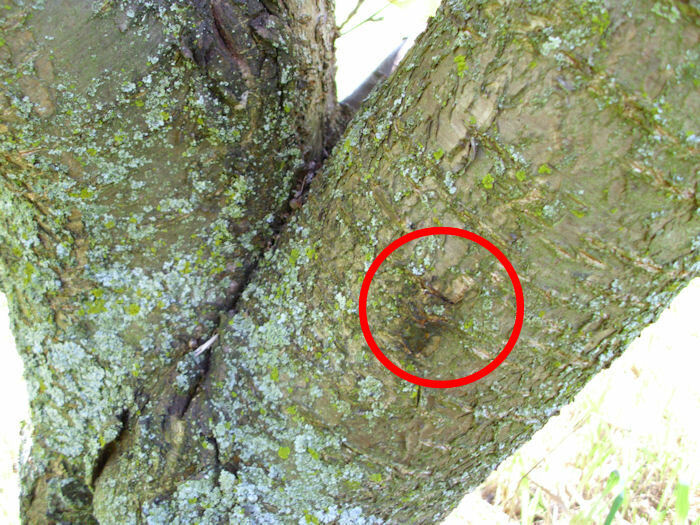 If you don’t provide a counter cut, the branch could break or the bark could end up peeled from the tree, inviting disease. This particular tree pruner is 14 feet long. The pole telescopes so I can make it shorter or longer as needed. Believe me, the ability to adjust the length is essential. The longer the pole, the more strength required to hold it up. After a few hours of using this tool, your shoulders are guaranteed to ache. Unlike most tree pruners, this tree pruner relies on a chain for the clipper head, which means that it’s a lot less likely to become tangled in the branches or get twisted. The chain also reduces friction so you don’t use as much muscle to cut the branches. The tree pruner also has a razor saw for cutting larger branches. You have to develop a technique for cutting the branches because when you get up this high, they tend to sway back and forth with the saw, rather than being cut by it. I find that moving my whole body in the correct rhythm (counter to the tree sway) does the trick. If possible, get a fiberglass pole. Wooden poles tend to get heavy and can sometimes start getting weathered (making them splinter). This pole also includes a foam pad, which feels a lot more comfortable on the underarm when I’m cutting up higher than shown in the picture. That’s the equipment needed for tree trimming: hand pruner, pruning saw, lopper, and tree pruner. To keep from spreading disease between trees, make sure you wipe your equipment down with alcohol after cutting a diseased tree (some people recommend after every tree). However, the alcohol rub will cause your equipment to rust. To keep that from happening, make sure you apply oil after the alcohol rub. Let me know if you have any questions or thoughts about equipment at John@JohnMuellerBooks.com. I’ll continue this post next week with some insights into pruning techniques and things you should look for as you prune.